The World Map is an important part of Elvenar, so you will visit it quite frequently. While exploring the World Map you will discover many different Provinces and other players' cities surrounding your own. Elvenar is a mysterious world full of secrets, but it is also peaceful. So don’t hesitate to get in touch with your neighbors and the area around you. Actually, you can visit any city, right from the start. When you enter the World Map for the first time, you will immediately notice that most of the world is still unknown to you. In fact, the World Map is not much more than a rough draft, at the beginning. However, you can frequently send Scouts to bordering Provinces in order to gain more information about them. The Scouts will tell you how easy or hard it will be to scout a Province and will demand a lot of Coins for their efforts, but they are definitely worth the price. Once their work is done, the scouted Province gets a lot more detail and color. But most importantly, you can take a look inside it and search for Relics. In addition, all bordering cities of that Province will also become "discovered". As a result, trading with those neighbors becomes cheaper and you will be able to start giving them Neighborly Help. Hint:It is advisable to scout only the number of Provinces needed for the next chapter in the Research Tree. 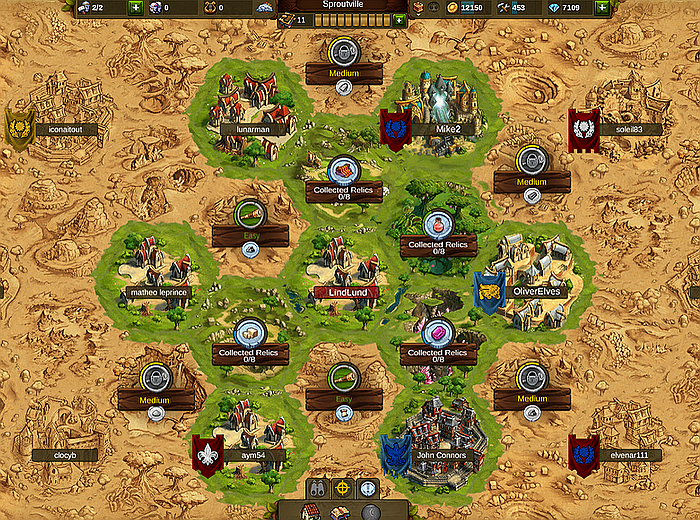 The cost for fighting or trading to complete the Province will increase with each newly scouted Province. And in later Provinces you will need Orcs to be able to "negotiate" (produced in Armories level 20 and above). When you enter a Province you previously scouted, you can see more detailed information about it. 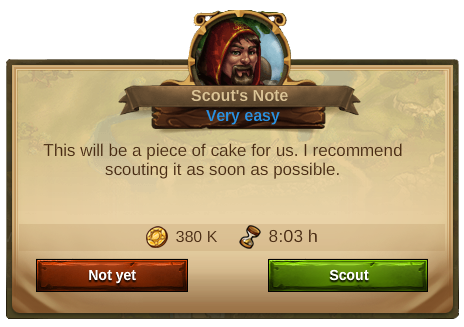 While on their mission of discovery, your Scouts will spot interesting people and will mark their location with an exclamation mark. At first, all Provinces may look alike, but, if you look closely, you will see each Province type has its own special terrain, depending on the Relics it contains. You may collect those Relics either by negotiating an Encounter, or fighting it. 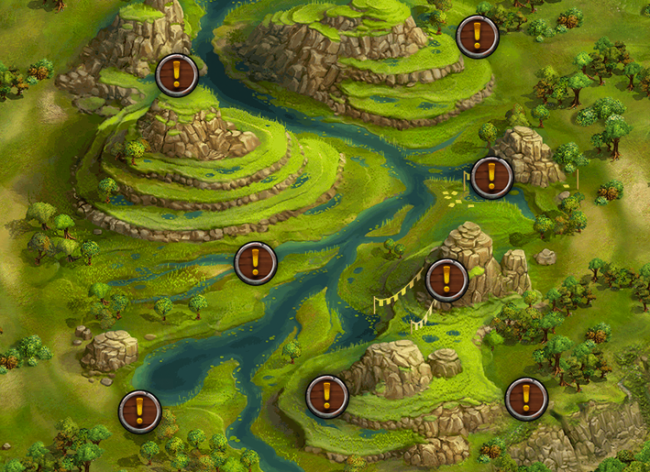 But, be aware, the enemy units you will find on each Province type will also differ, so, be prepared! The further you go, deep into the World Map, the more distant you get from your city. This means that not only will Scouts take longer to reach far away Provinces, but also it will cost you more Coins to scout them. The Province Distance will also influence the ranking points you get by solving each Encounter. You will get 1 ranking point per Encounter * Province Distance. For example, if you solve an Encounter on a Province, 3 Provinces away from your city (Distance 3), you will get 3 ranking points. Fighting and negotiating will get progressively harder the further away you get from your city, requiring that you need to keep upgrading your city to cope with the demands. Hint:After entering each province sector you will be able to see how far that province is by looking at the ranking points it will give you when finishing the encounter successfully. On each Province, you will meet a merchant who may offer you a Relic. And you just can’t have enough of these magical objects! But of course, they will come at a price. You may take the merchant's offer or maybe, you can find a way to use your troops to get the Relic and save your resources. It’s up to you! No matter how you get the Relic, it will always increase your knowledge! 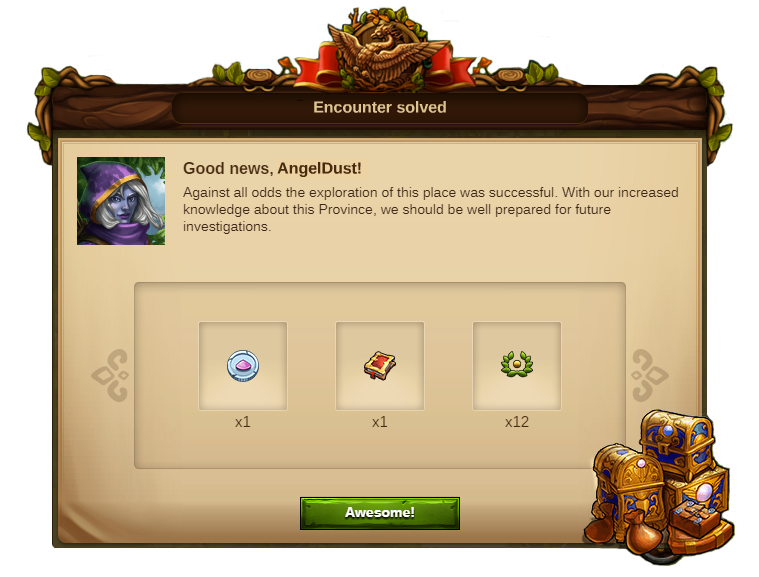 In other words, for every Encounter you solve, you will receive a Knowledge Point you can spend in Research Tree, to unlock technologies faster, or invest in Ancient Wonders. The World Map is a great source of knowledge, you will see! Hint:By collecting Relics you can also increase the production boost for your boosted Goods. 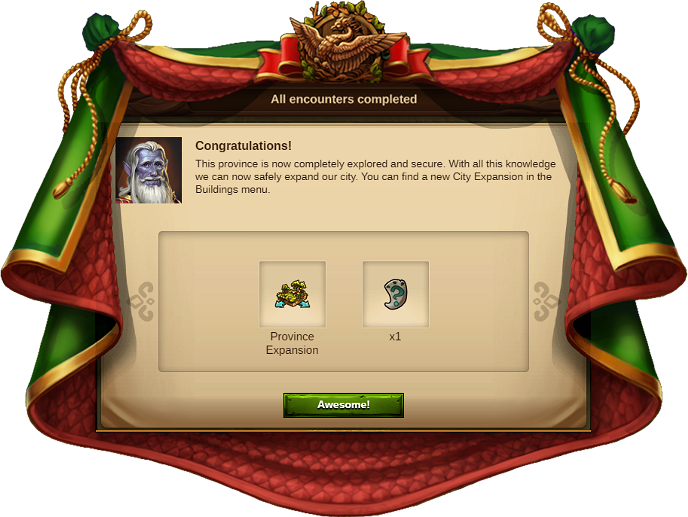 By completing Provinces you can also get additional rewards: Province Expansions and/or Rune Shards. After researching the first Ancient Wonders' Technology, every time you complete a province you will also get a random Rune Shard for one of the unlocked buildings, which you can find in the Ancient Wonders' Menu. As said before, by exploring the World Map, you can both scout Provinces and visit every city right from the beginning! You can take a look into other players' cities, in order to get inspiration for you own, but once you "discover" those cities, you will also be able to give them Neighborly Help. At a certain point in the game, if you take a closer look, you may notice each neighbor has a different image representing their city. 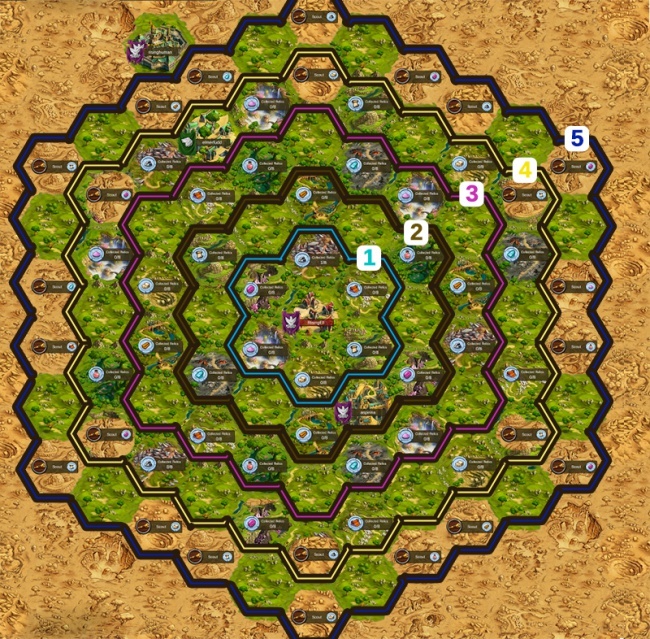 This is due to the fact that, when a player reaches a new Chapter, the map reflects the city´s development. The World Map is also the place where Tournaments take place! You can enter them only if you belong to a Fellowship. Every week, Tournament Events take place in your solved provinces of one type, which will rotate every week. This is also a great opportunity for you to get additional Relics, Knowledge Points and Rune Shards and, if you are one of the best, additional Ranking Points! This page was last modified on 4 August 2018, at 13:21.